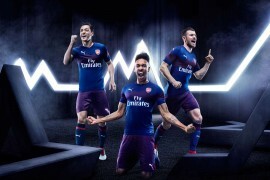 As if to say – “Don’t worry, we’ve not forgotten you!” adidas have launched a new colourway exclusive to the adiZero in the wake of the launch of the adiZero Prime! Definitely an exciting pair of football boots to look at, these are exactly the adiZero we’ve come to know and love, but with the new upper design of the adiZero Prime. There’s been a couple of misconceptions over this colourway already, but we’ve got the inside track from adidas to set the record straight. 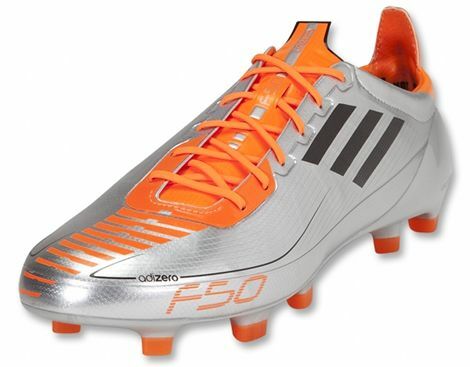 Firstly these are completely exclusive to the ‘standard’ F50, with no plans to have an adiZero Prime in this colourway, despite it’s looks. Secondly there had been some chatter that these would be a Messi-exclusive colourway – and there’s no doubt they’d look phenomenal on the feet of the mercurial Argentine – but as they’re exclusive to the F50, they’ll be for general usage, with Messi adopting the Warning/Black/White adiZero Prime as his football boots of choice. Onto how the colourway looks on these lightweight football boots; it’s definitely going to be a divisive colourway, as the glaring Chrome and searing Warning orange aren’t going to be a colourscheme everyone wants on their feet. For what it’s worth, we think they work well on the adiZero‘s slightly box-y upper, and they remind us of an old Mercurial Vapor II colourway from way back! This wild colourway launches alongside the adiZero Prime on the 1st of February 2010 and will mark the first adiZero to see a price-hike, as they go up to £139.99 from £124.99. What do you reckon to these bold adidas football boots? Let us know on the boot-o-meter below! Previous articleadiZero Prime – Stolen! I THINK I’M IN LOVE!!!!!!!!!!!!!!!!! We need more metallic boots in the world!!!!!!!! i think this is the best (and smartest) adizero prime’s colorway. it supports prime’s futuristic striping (what i called earlier as transformer-ish striping) with futuristic chrome upper. the black obviously goes perfect with chrome, and the orange is really making a statement. not to mention this one had a uniform colored studs -no offense to those who like it, but the multi colored studs are just retarded and made it looked cheap. anyway, nice info there! 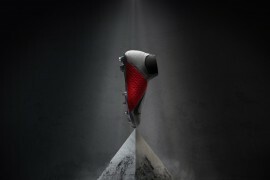 i really thought that this one are going to be messi’s signature colorway! i mean, why shouldn’t we thought so? 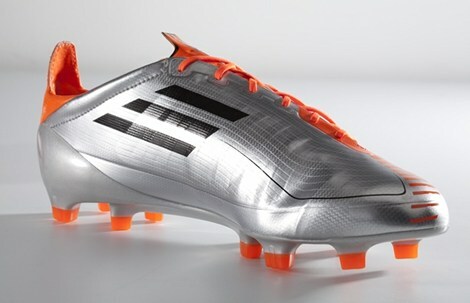 he’s already famous for silver-ish colors since his signature silver/blue F50.9. Have you read the article? If not, bottom line is this is a F50 Adizero exclusive colourway and won’t be seen on the Prime and Messi is going to use Warning /black / white as his colourway, no exclusive colourway for him. In other news, Footy-boots are honestly telling me transferring the design from the Prime and giving it a new paint job on the Adizero costs ÂŁ15? 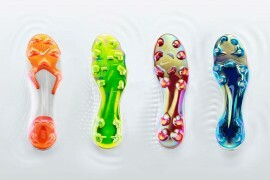 Is anyone expecting a split or will everyone go Prime of the players who have taken up the Adizero? does prime has leather versions? if not, then professionals who prefer leathers could stick with original adizero. 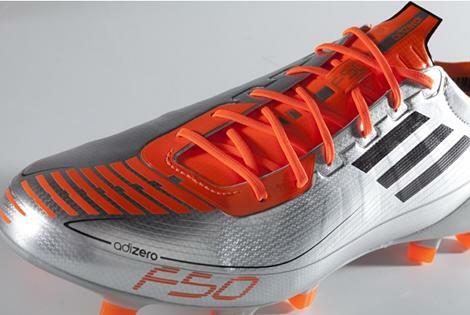 Many bundesliga players are training in the new adizero but not the prime as yet from what I’m seeing. You guys should know better. Pro’s love their leather! Especially when training. Maybe they will wear the prime in games but so far many of them are wearing orange (warning) adizero’s in leather. Again, to make it clear: the old adizero design is changed to the design of the primes and still exist in leather. 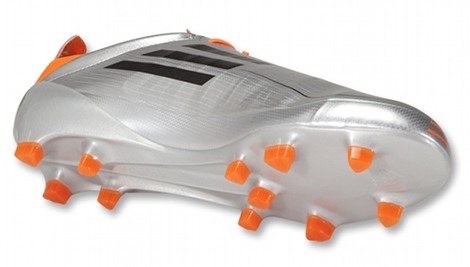 Primes have the differently coloured studs and the new adi-twin lite synthetic material and don’t come in leather. Very simple. nice… but a 16GBP hike for a redesign?! 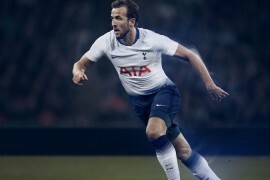 The longer stripe down the side definitely makes me think these are the American Football designed adiZero 5-Star, very similar but the weigh a bit more and have a lateral stud that’s not used on most football boots!